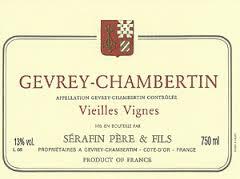 2015 Serafin Gevrey Chambertin VV - $64.99: Vins Rare, The finest selection of rare wines. This is both aromatically fresher and more expressive with its attractively layered mix of both red and dark berries that is liberally laced with notes of earth, humus and underbrush plus a hint of wood spice. The lush and velvety yet quite muscular medium weight flavors possess slightly better mid-palate concentration along with somewhat firmer supporting tannins on the lingering and well-balanced finale. This robust effort will need at least a few years of bottle age to unwind before it will drink well. Burghound 89-91 Outstanding!